A look at some of the announcements. The most important event on the annual videogame calendar may still be E3, but in recent years some have rightly begun to worry that the show only serves the interests of fewer and fewer big hitters. Never mind trying to capture any attention if you're a budding independent developer, even some AAA Game of the Year contenders can struggle to be heard above the latest news and videos from Military Shooter 17: Colon Subtitle, Sportsball 2016, and Swords and Spells III: Worlds of Generica. 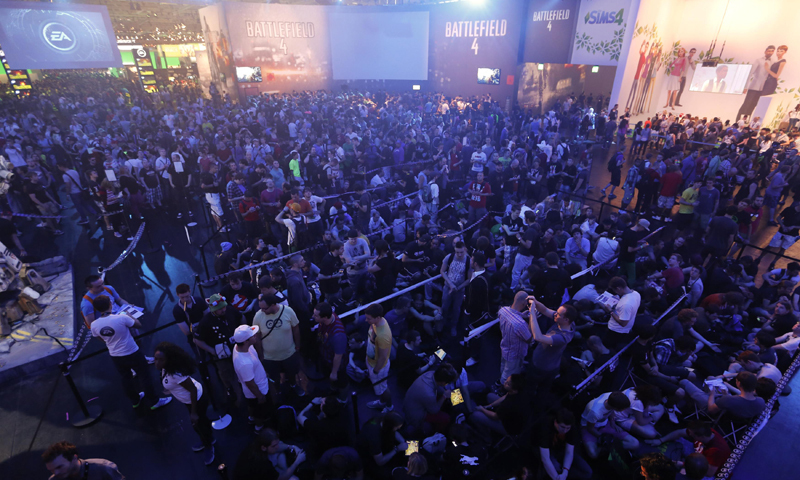 Small wonder many publishers and developers now treat E3 less like a three-day event and more like a season. Where once games were announced at the event, now they're announced days and weeks ahead of it to ensure their expertly cut trailers and carefully rehearsed talking points actually get some attention. EA has been hinting at a new game from BioWare over the last few weeks with a series of teaser trailers called "You've Been Chosen". If there's a common theme to them, it's that they all appear to focus on the supernatural. They're all also contemporary. That's unusual for BioWare, a studio known for its fantasy and sci-fi games. In an open letter announcing his amicable departure from BioWare today, Casey Hudson noted, "The foundation of our new IP in Edmonton is complete, and the team is ready to move forward into pre-production on a title that I think will redefine interactive entertainment." Dates referred to in the teaser trailers suggest that all will be revealed on the first day of Gamescom, August 13. Quantum Break is in development at Remedy, the studio behind Max Payne and the excellent but poorly timed Alan Wake. The Xbox One exclusive is an episodic transmedia project that the developer calls "the ultimate Remedy game". "The game is about heroes. The show is about villains. In the game, you play Jack Joyce in a desperate fight to stop the fracture that threatens to cause the end of time," said Remedy's Sam Lake. "In the show, in the style of an edgy modern TV series, you follow the schemes and power play inside Monarch, the corporation that’s Jack’s main enemy." In an interview earlier this year, Remedy CEO Matias Myllyrinne elaborated on the game’s transmedia aspects, saying that decisions made by the player in each episode would be reflected in the subsequent “high-quality TV episode”. “Once you’ve made your choice[s], you can enjoy a high-quality TV episode where you’ll see how your choices impacted certain things. Unlike many other games, you actually get to know what the consequences of your choice[s] are." Quantum Break has been pegged for a Gamescom reveal since May. In recent years Blizzard has made cameo appearances at E3, but as a rule it saves its biggest announcements for its own semi-annual BlizzCon event in Anaheim, California. It also uses Gamescom as a chance to serve its European fans, and this year will be no different it seems. Blizzard has said it will reveal a new cinematic trailer for its upcoming World of Warcraft expansion Warlords of Draenor, and cinematics are one of Blizzard's strong suits. The developer will also set its release date for the expansion, which is currently in beta. We're betting Warlords of Draenor be some time around of after BlizzCon, and we're picking that Gamescom will kick off several months of celebrations leading up to the game's 10-year anniversary this November. It should come as no surprise that Europe's most prominent publisher should have something up its sleeve for the continent's main event. In Assassin's Creed Rogue players will control an Assassin-turned-Templar named Shay Patrick Cormac who hunts down his former comrades for the Templar order. The game is set during the Seven Years' War, which took place between 1754 and 1763, and spans from Alabama to New York and Quebec, right up to the arctic circle. Assassin's Creed Rogue doesn't have new-gen glamour, but already we're excited to see Ubisoft mixing things up and experimenting with the formula by making the lead character one of the series' villains. Assassin's Creed Rogue will round out the "Kenway Trilogy", which started with Assassin's Creed III. Playing as a Templar should provide great perspective of some of the series' larger themes, as well as help us all to embrace our inner antihero. That's actually the second teaser trailer. The first was even less informative. It depicted a snowflake soaking up spattering blood. Usually with teasers like these we like to step back from the platform and let the hype train rumble on by, but there's something about its pared back survival horror aesthetics that we can't stop turning over in our heads. There's some speculation around the Internet that it could be teasing Until Dawn, which Sony first revealed at Gamescom 2012. Until Dawn was a survival horror Move game set in snowy woods. Players would need help seven teenagers survive a night of terror using the Move as a flashlight. Until Dawn didn't grab our attention then, and given how quiet Sony has been on the subject since that reveal two years ago, we're betting we weren't the only ones who were underwhelmed. If it is Until Dawn, we're betting it's a far cry from what was first shown two years ago, and that would be no bad thing. These are just some of the games that will be on display at Gamescom. Let us know in the comments what you're most looking forward to.